(304 x 400 mm) 13 x 19 in. Vajradhara (Tib. Dorje Chang), the 'vajra-holder', is the primordial or Adi-Buddha of the Sarma or 'new' translation schools of Tibetan Buddhism, while Samantabhadra is the primordial Buddha of the Nyingma or 'old' translation school. These two deities are the only manifestations or expressions of the dharmakaya in the entire Vajrayana pantheon, and are viewed as the source from which most of the Tantras and their lineages of transmission emanate. Thus Samantabhadra commonly appears crowning many Nyingma lineage or deity thangkas, while Vajradhara crowns many thangkas belonging to the Sakya, Kagyu, Kadampa and Gelugpa traditions of Tibetan Buddhism. In the Kagyu lineage Vajradhara is recognized as the direct source of the tantric traditions that were transmitted by the Indian mahasiddhas Tilopa and Naropa, and then disseminated in Tibet by Marpa and his illustrious lineage, which includes Milarepa, Gampopa and the first Karmapa, Dusum Khyenpa. Both Vajradhara and Samantabhadra are dark-blue in colour, which represents the unchangeable emptiness and space-like nature of the dharmakaya. But whereas Samantabhadra is represented in the aspect of a naked and unadorned Buddha, Vajradhara appears wearing the thirteen silk and jewel ornaments of a sambhogakaya deity. Essentially Vajradhara represents the secret aspect that Shakyamuni Buddha assumes in order to reveal the Tantras. He is the source of the Five Enlightened Families, who represent the five purified aggregates of form, feeling, perception, motivation and consciousness. And as such he is sometimes known as the 'Lord of the Sixth Family of all Vajrayana mandalas'. Vajradhara sits in vajra-posture upon a white moon and sun disc, a multicoloured lotus, and a jeweled throne that is supported by eight lions. He is peaceful and youthful with a sweetly smiling face and two bow-shaped eyes, and he is endowed with the thirty-two major marks and the eighty minor signs of a fully enlightened Buddha. His long black hair is piled up into a topknot, which is adorned with a radiant wish-granting gem. He wears lower garments of embroidered silks, a billowing green silk scarf, and the eight jewel ornaments. His two hands are crossed in front of his heart in vajra-humkara-mudra, with his right hand holding a vajra and his left hand holding a bell, symbolizing the union of his skilful means and pristine awareness. His right vajra-holding hand is held in front of his left bell-holding hand, symbolizing that the 'outer' aspect of his skillful means arises from his 'inner' aspect of wisdom. Behind his radiant orange aura appears the torana of his 'six-ornament enlightenment throne', which consists of two elephants that support a jeweled bar, upon which are two mythical blue horned-lions with young gods riding upon their backs. These gods support another jeweled bar upon which two ferocious makaras or water-monsters crouch, with fabulously swirling golden tails. Two naga-serpents appear above the makaras, with their upper bodies in human form and their lower bodies in the form of coiling blue snakes. These nagas are crowned by a canopy of five small serpents and hold wish-granting gems in their cupped hands, and the ends of their tails are grasped by the crowning image of a flying red garuda with blue wings. A small image of Vajradhara also appears at the top centre of this painting, where he represents the source of 'four special transmissions' (Tib. kyi bka' babs bzhi) that were received by the Indian Mahasiddha Tilopa (988-1069), the founder of the Kagyu tradition. Tilopa then taught these four oral transmissions, or 'rivers of instruction', to his main disciple Naropa (1016-1100), which became the primary source for the 'Six Yogas of Naropa' that were then transmitted through Marpa, Milarepa and Gampopa into the four major and eight minor Kagyu lineages. These four lineages of oral transmission are represented by the four directional groups of four Mahasiddhas that appear above either side of the large central image of Vajradhara. Flanking Vajradhara at the top are the two bodhisattvas Ratnamati (Lodro Rinchen) and Sukhanatha, and below them is the early Indian Mahasiddha, Saraha (circa 770-840). Saraha is recognized as the first human guru of the Mahamudra and Chakrasamvara Tantra lineages, and he traditionally appears as an arrow-smith testing the straightness of one of his arrows. Ratnamati and Sukhanatha received the Mahamudra teachings directly from Vajradhara, and then helped to transmit them to Saraha. Ratnamati appears here in the form of white Vajrapani, who holds a vajra and bell, and represents the 'father-tantra' practice traditions. And Sukhanatha appears in the form of the red dakini Sumati Samantabhadri, who holds a curved knife above a skull-cup, and represents the 'mother-tantra' practice traditions. Seated upon horizontal clouds in the upper left corner are the four Mahasiddhas from the South of India, whose lineage descends from Saraha's disciple Nagarjuna (top right), to Aryadeva (lower right), Chandrakirti (top left), and Matangi (lower left). This transmission is generally associated with the father-tantra lineage of Guhyasamaja, and the yogic practice of the 'illusory body' (Skt. mayakaya; Tib. sgyu-lus). Seated upon horizontal clouds in the upper right corner are the four Mahasiddhas from the North of India, whose lineage descends from Vajrapani and Saraha to Luipa (top left), Darikapa (lower left), Sukhadhari (top right), and Dengipa (lower right). This transmission is generally associated with the Mahamudra lineage of Vajrapani and Saraha, and the yogic practices of the 'transference of consciousness' (Skt. samkranti; Tib 'pho-ba), and the 'intermediate state' (Skt. antarabhava; Tib. bar-do). In the middle left sky are the four Mahasiddhas from the West of India, whose lineage descends from Dombhipa (top right), who rides upon a fierce tigress with his consort, to Vinapa (top left), Lawapa (lower right), and Indrabhuti (lower left). This transmission is generally associated the mother-tantra lineage of Hevajra, and the yogic practice of luminosity or 'clear light' (Skt. prabhasvara; Tib. 'od-gsal). In the middle right sky are the four Mahasiddhas from the East of India, whose lineage descends from a yogini known as Sumati, Subhagini or Sukhasiddhi (top left), to Shinglopa (top right), Tanglopa (lower right), and Karnaripa (lower left). This transmission is generally associated with the mother-tantra lineage of Chakrasamvara, and the yogic practices of 'inner heat' (Skt. candali; Tib. gtum-mo), and 'dream yoga' (Skt. svapna; Tib. rmi-lam). (Note: I use the term 'generally' here, after having spent three days trying to determine which of these four transmissions came from which lineage of Tilopa's Indian gurus. 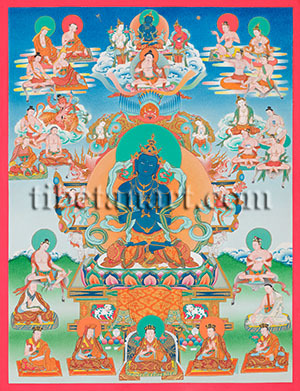 The early biographies of Tilopa by Marpa, Gyaltangpa and Wangchuk Gyaltsen all give different lists, with only Wangchuk Gyaltsen's covering all of the Six Yogas listed above. There are also some variations in the directions assigned to these four groups of Indian Mahasiddhas, and to the Tantras associated with them). Tilopa appears below and to the left of Vajradhara's lion-throne holding the attribute of a fish, while his disciple Naropa appears to the right holding a skull-cup. Below them on the left and right are Naropa's disciple Marpa (1012-1097), and Marpa's disciple Milarepa (1052-1135). Enthroned at the bottom centre is the Eighth Karmapa, Mikyo Dorje (1507-1554), and to the left and right of him are Milarepa's disciple Gampopa (1097-1135), and Gampopa's disciple Dusum Khyenpa (1110-1193), the First Karmapa. In the lower left corner is the Twelfth Karmapa, Changchub Dorje (1703-1732), and in the lower right corner is the Thirteenth Karmapa, Dudul Dorje (1733-1797).